There’s no shortage of amazing keto dessert recipes out there, and these are no exception, you guys! We have an assortment of cakes, cheesecakes, and candy that are sure not to disappoint. Pudding cakes (or lava cakes, as they’re also known) are a staple at our house for Valentine’s Day because they’re so easy to make, taste delicious, and are often perfectly portioned for two! This Keto Chocolate Pudding Cake from Grumpy’s Honeybunch will definitely have to make an appearance at our house soon because will you just look at how good that looks?? This recipe also comes from Grumpy’s Honeybunch and can be made in the microwave! Yes! A Valentine’s Dessert for those of us who like to keep things low-key when we celebrate. Don’t get freaked out by the name of this Chocolate Mayonnaise Cake, even if you hate mayo. (Are you even allowed to hate mayo on a keto diet?) This cake will not taste even remotely like mayonnaise, but the mayo will give it fantastic texture and keep it moist. I’m sorry for saying the m-word. Please forgive me. I’m a huge fan of cheesecake. It might be my favorite category of desserts (if I could ever pick a favorite) so you know I have a Valentine’s cheesecake recipe up in here. This Keto Strawberry Cheesecake For Two makes two mini heart-shaped cheesecakes with chocolate crusts and strawberries swirled in to the cheesecake for the prettiest little dessert you ever did see. How gorgeous are these no-bake Easy Raspberry Keto Cheesecakes from I Eat Keto? I’m thinking I definitely need to get some martini glasses for making fancy desserts in. This recipe looks both simple and tasty and it can be made ahead and kept in the fridge! Hashtag winning! If coffee is more your style, The Low Carb Keto Kitchen has this Peppermint Mocha Cheesecake that is beautifully simple and decadently rich! Make this one ahead, too, and pull out of the fridge whenever you’re done with dinner! Ok, this one is technically not a cheesecake, it’s a tart with a mascarpone filling. But it’s hella delicious and it’s pink and chocolate and raspberry and everything that’s great about Valentine’s Day. My Chocolate Raspberry Tart is also made completely without sweeteners, so if you don’t want to invest in low carb sweeteners or don’t like them, this is a great dessert for you! Sweetened only with raspberries and super dark chocolate. What is Valentine’s Day without a box of chocolates? Guys. I cannot get over how gorgeous these Keto Chocolate Raspberry Truffles are! STUNNING! I have all the heart eyes looking at these. And you’ll never go wrong with raspberries and chocolate. And for all of you who, like me, can’t ever get enough of that chocolate/peanut butter combo, you can totally use my Peanut Butter Cup recipe and a heart mold to make your own Valentine candies. And if you’re a coconut fan, you can be even lazier and use Coconut Butter for your filling! 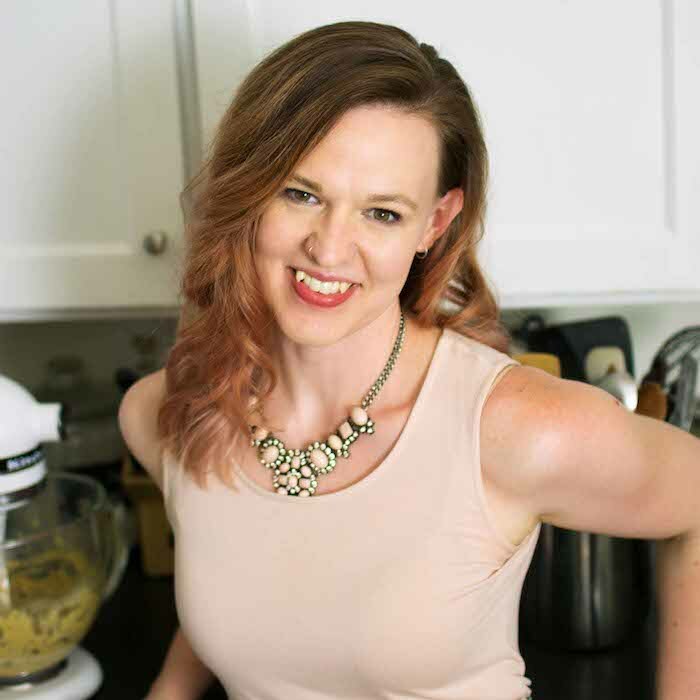 Hi Amber, Thank you so much for including the Valentine’s Day Dessert from my website in your round up! Cassie and Jennifer did great with their recipes and I’m so proud to have them as part of my team! Thanks so much for letting me use them, Shelby! These recipes are great! Yes, thanks for sharing! Great roundup! Digging that chocolate pudding cake! Great post can’t believe Valentine’s Day is just around the corner! I know, right?? January just started, I swear.